This year at Saltuary, we are proud volunteers for Share the Dignity, an Australian charity that collects essential products for at-risk women living in homeless shelters. Simply fill a bag with sanitary items and “life’s little luxuries” (shampoo/conditioner, soap, lipbalm etc), and drop it off at Saltuary by the 11th of December! What is Share the Dignity? 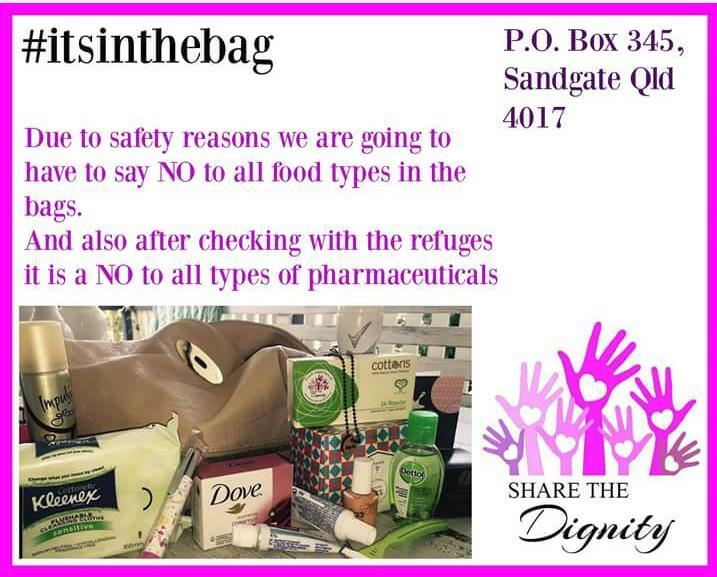 Share the Dignity is an Australian charity that collects essential products for vulnerable and at-risk women. Now run by over 70 volunteers, the charity was first started by Rochelle Courtenay and a group of friends, bridging the gap between homeless women and their need for sanitary products and “life’s little luxuries” that we take for granted. By providing women with essential products, Share the Dignity’s vision is to restore a sense of dignity to women in need. With collection points in every state, the charity runs Australia-wide campaigns such as #itsinthebag. This campaign encourages people—particularly women—to fill a bag with pads, tampons, moisturiser, sunscreen etc, and donate it to women in need. #itsinthebag—how do I get involved? This year at Saltuary, we are proud to be a volunteer drop-off point for #itsinthebag! For all you good Samaritans out there, this is your opportunity to help vulnerable and at-risk women in NSW. Many of these women are victims of domestic violence, and are living in women’s refuges and homeless shelters. So, grab a bag you rarely use, pop in some spare sanitary products, and add “all the little luxuries” you have lying around, but don’t actually need! ← Introducing Saltuary’s Natural Pharmacy!